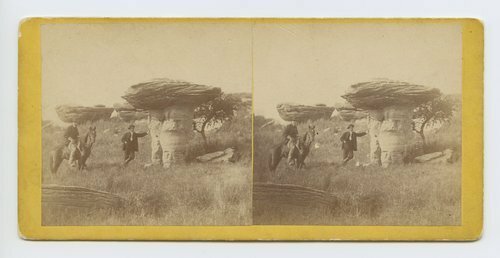 This stereograph showis Mushroom Rock, a rock formation, on Alum Creek, Kansas. There is a man and a horse and rider next to the rock. It is from Alexander Gardner's series, Across the Continent on the Union Pacific Railway, Eastern Division.